The authorities in Taiwan have accused Kenya of using guns and tear gas to force 37 Taiwanese on to a plane bound for mainland China. Eight other Taiwanese were deported to mainland China on Monday, prompting Taiwan to accuse Beijing of "extrajudicial abduction". China has praised Kenya for supporting its "one-China policy". 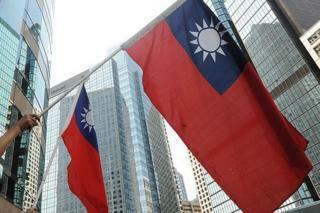 Beijing views Taiwan - self-ruling since 1950 - as a renegade region that must be reunited with the mainland. It insists that other countries cannot recognise both China and Taiwan, with the result that Taiwan has formal diplomatic ties with only a few countries. Taiwan does not have formal diplomatic relations with Kenya. Taiwan's foreign ministry said Kenyan police had forced 22 Taiwanese citizens, arrested on suspicion of fraud, to board a plane bound for China on Tuesday, despite protests from John Chen, Taiwan's representative to South Africa. Another 15 Taiwanese, who had been acquitted in the case, were also coerced into boarding the plane, it said. Officials said some of the deportees had tried to prevent Kenyan police from entering their jail cell, as video posted by Taiwan's Central News Agency appears to show. The police broke down a wall, "threw tear gas" and brandished "assault rifles" to force them on to the plane, Antonio CS Chen, the chief of the West Asian and African Affairs section of Taiwan's foreign ministry, told reporters. He said Chinese diplomatic officials had been present. Taiwan's representatives from South Africa had rushed to Kenya to try to stop the deportations but they were prevented by the Kenyan authorities, who worked closely with Beijing, from gaining access to the Taiwanese. Officials say the Taiwanese may have worked with Chinese nationals in a telecommunications fraud ring to cheat people in China of money. But regardless, they say, the two sides had worked out a verbal agreement not to extradite each other's people in such cases, following a similar incident involving the Philippines extraditing Taiwanese crime suspects to China in 2011. It took nearly five months for Taiwan to negotiate their transfer back to Taiwan. The fact that this is happening just a month before Taiwan's newly elected President Tsai Ing-wen takes office is no coincidence. It is widely believed that Beijing is doing this to put pressure on Tsai to recognize that the two sides are part of one China. She comes from a party that favours Taiwan's independence and has so far remained vague on the issue. By taking the Taiwanese in Kenya, Beijing is sending a strong message to Ms Tsai that the honeymoon period for her is over and more of these headaches await her after she takes office if she continues to ignore China's demand. Kenyan government spokesman Eric Kiraithe defended the legal process that had led to the deportations. He said Kenyan courts relied on information available and he rejected what he called media insinuations. An interior ministry spokesman told Reuters news agency the 37 people had come "from China and we took them to China", adding that Kenya had "an obligation to ensure if people are here illegally they are taken back to where they came from". When asked about the case, Chinese foreign ministry spokesman Lu Kang told reporters: "The one-China policy is an important pre-condition for bilateral relations with China and other countries. We commend Kenya for its upholding of this policy." What's behind the China-Taiwan divide?